2008. Birds of Tin is a pseudonym for experimental sound artist Brooke Oates. He has previously collaborated with Rapoon and Augur (Steve Brand), and released several solo and collaborative works on a variety of labels, most notably Manifold and Mystery Sea. 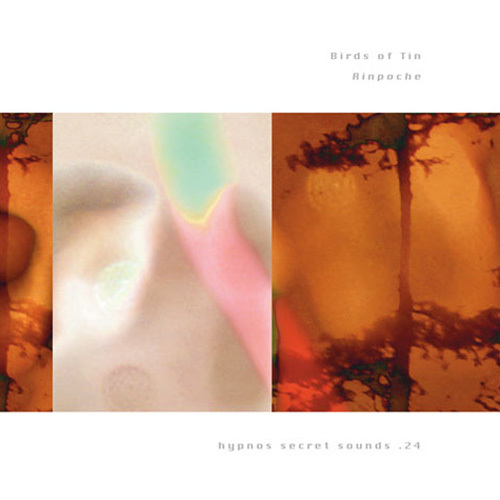 We are pleased to announce the first release by Birds of Tin, Rinpoche, on the Hypnos Secret Sounds sub-label. This recording comes from an in-studio live improvisation from 2002, and covers a strange and varied sonic territory. Working in the realm of sound art as much as "music," the artist creates an effect that is hypnotic and at times seemingly psychoactive. "Birds Of Tin is the one man project of Brooke Oates and there has been no new release since 2004. That perhaps might be right, since the recordings here on 'Rinpoche' were improvised in 2002. Birds Of Tin had releases on Manifold, Solipsism, Mystery Sea and XZF. What Oates does here is pretty much outside the lines of Hypnos: no finely woven tapestries of synthesizers, but a likewise finely woven pattern of all sorts of heavily treated sound objects. Lots of echo and reverb on the tea cups that is. Two pieces, together spanning some seventy-five minutes, whereas one would have been enough. Another difference is the improvisational aspect of the music, also not unlike Hypnos. Birds Of Tin seems to me a man who loves his record collection - don't we all - and particularly records by zoviet*france and to a lesser extent Rapoon. Sometimes things are a bit too haphazard in the way its put together, but then in other moments he proofs to be capable of producing a nice tune. A pair of scissors to splice the tape would be handy though."